The mechanics of the game are pretty easily explained by the cards themselves. If you’re not aware of the Stroop effect, it’s basically about how your brain processes information and how you can interfere with that. If the word red is in blue, your brain has to hesitate a moment while you work out whether it wants to identify the redness or the blueness. A connected part of this is the way your brain handles swearing. Swearing doesn’t belong in the same part of the brain as the language centre – which means that calling on those swear words also interferes with your brain’s behaviour. 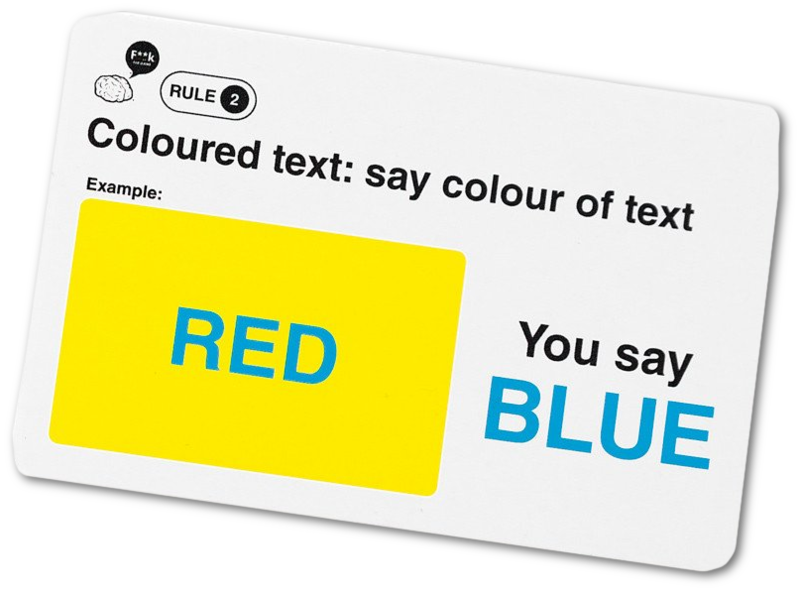 That means you have a deck of cards with brightly coloured words and backgrounds on them, colour words, and swear words, all designed to be hard to quickly describe or state – not at all impossible, just deliberately interfered with. Imagine if a game of Snap used almost identical cards, so you had to hesitate a little. Anyway, this is a neat little design – certainly not a bad design and it’s neat enough that it has a good reason to want to involve all the swearing. I was pretty meh on the design until I popped it open and found this card waiting for me. … If any game had an excuse to not consider this kind of swear word use, it’d be this game. After all, it’s brain science! 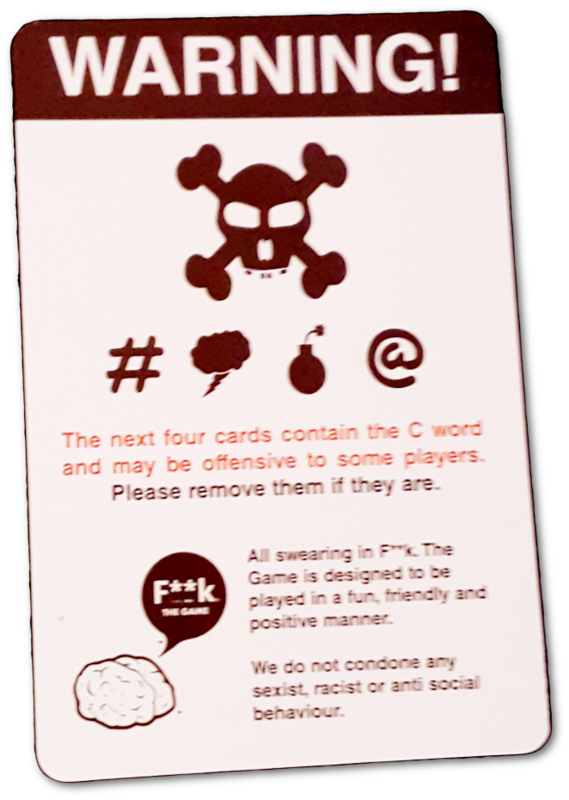 But instead, the makers of F**k decided to both carefully quarantine the c*nt cards, make sure you thought about whether or not to include them, and made a note on that card about how the swearing should be treated. 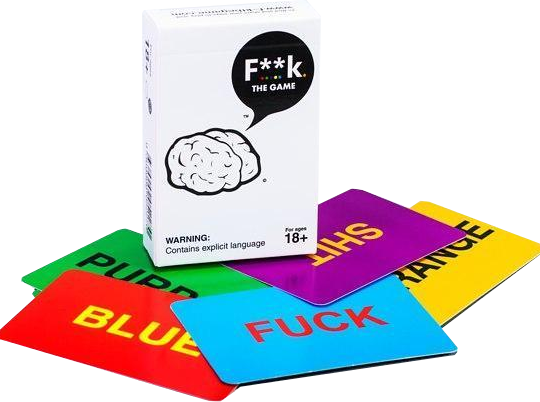 It’s pretty impressive, and certainly elevates this little cuss-box party game. I don’t think I’ll get this to the table very often, but I certainly think pretty well of it, now.